For the past 16 years, the natives from 17 Bidayuh villages at the foot of Mount Serumbu have been fighting a silent ‘war’ against Serumbu Quarry Sdn Bhd, which has been given a licence to extract stones from the mountain. They have been writing letters, five all in all, with the latest on Oct 30, 2013 to Chief Minister Abdul Taib Mahmud with copies to their Member of Parliament for Mambong, James Dawos Mamit, and the Bengoh state assemblyperson Dr Jerip Susil (left) and other relevant authorities asking the chief minister for the company’s licence to be revoked. They have also lodged two police reports against the company, with the latest being on Oct 7, 2013. All their complaints have fallen on deaf ears. Speaking to the media during a peaceful protest at the quarry site on Sunday, Siyium Anak Mutit, a former MP, said that the people were wondering how the company managed to get hold of the licence to extract stones when the Natural Resources Environment Board (NREB) had rejected the environmental impact assessment (EIA) report due to the closeness to several villages. The licence was issued in 1997, but the company started to clear works including building an access road to the foot of the mountain only a couple of months ago, he said. Some 50 people comprising Bidayuhs, Chinese and Malays took part in the protest. “We have been fighting a silent war since 1997 and have written at least five letters to the chief minister and the relevant authorities. All this while, our fight has failed,” said the former MP. “But now we can no longer be silent. We want the public to know, and we want the media to highlight our fight against this company and demand that the authorities revoke the licence,” he said in a statement read out to the media. Siyium said: “The mountain is sacred to us. There is a well on top of the mountain, which according to our legend, is the bathing place of the spirits. “No one is allowed to disturb anything near the well or take away anything or dirty the place such as passing urine, otherwise they will fall sick due to the curse by the spirits,” he said. He said besides having very rare species of flora and fauna, the foot of the mountain is their ancestral and native customary rights (NCR) lands which are planted with fruit trees such as durian and rambutan. “It has been the ancestral land for the people of Serumbu, and our forefathers had cultivated the area for more than 200 years. “It is our roots, our civilisation and heritage. It has a colourful history. Even the Brooke family built a cottage at the foot of the mountain,” he said. “Moreover, it is the source of our drinking water,” he said, pointing out that there are more than 10,000 people from 17 villages who depend on the mountain for their source of water. He said that if Mount Serumbu were to be quarried, then not only the people including one Malay kampung and Chinese community would be affected, but also the environment. “It would be would be catastrophic to the environment because of pollution, dust and noise, apart from destroying our NCR land,” he said. 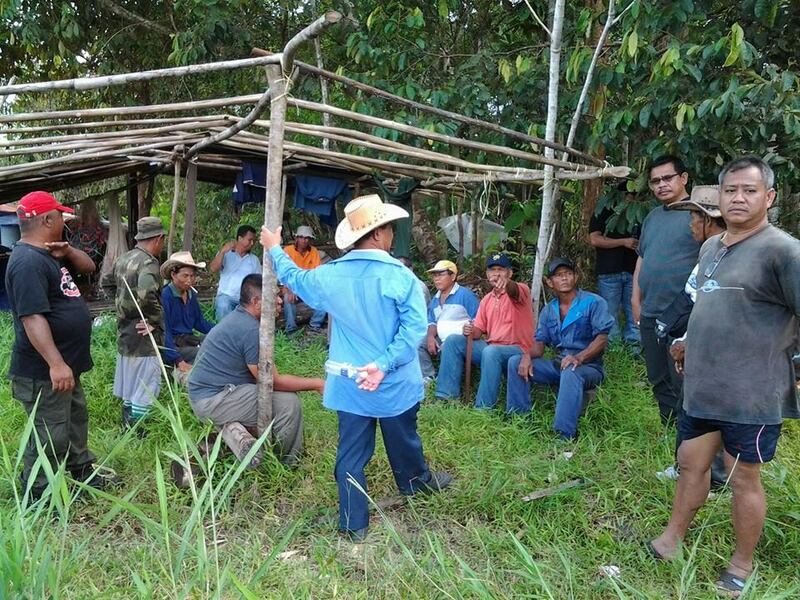 Siyium also urged other Bidayuhs from Serian, Bau and Lundu to work together to defend their rights and NCR land. “We must work together to show that we have strength and unity. You can never know that the next time it could be your mountain and land which will be taken by these greedy people,” he added. He said that only the week before, the Bidayuhs of Bukar Sadong in Serian had protested against logging activities at Mount Sadong. It was a happy ending for them, he said, as the logging licence was revoked due to the efforts of their elected representatives. Siyium also urgedtheir MP and state assemblyperson to help resolve their issue. In the meantime, he said the natives have consulted their lawyers with a view to take legal action as a last resort. Meanwhile, Penghulu Lei Say Hiong, on behalf of the Chinese community, and Alwi Bol, representing the Malay kampung in Siniawan Baru, supported the move by the Bidayuh community in asking the government to revoke the quarry licence. Penghulu Lei said that the Chinese who farm in and around the area would also be greatly affected by the quarry, while Alwi said the Malays who live nearby would suffer from noise pollution and dust. The people’s frustrations are understandable as they are fighting against Serumbu quarry sdn bhd which allegedly has links to the family of the chief minister. The stones found in the mountain are of granite type which is considered to be best for the construction of high-rise buildings, retaining walls and airports. The stones in the mountain are worth hundreds of millions of ringgit. $500 in one rural vote and get 1000plus return. It is the best investment deal for the elite ruling class. The greed of these people has gone beyond human boundary. It is satanic!